Totally amazing Cheesy Spinach Stuffed Chicken Breast is an easy dinner to prep ahead making your weeknight meals come together in minutes! 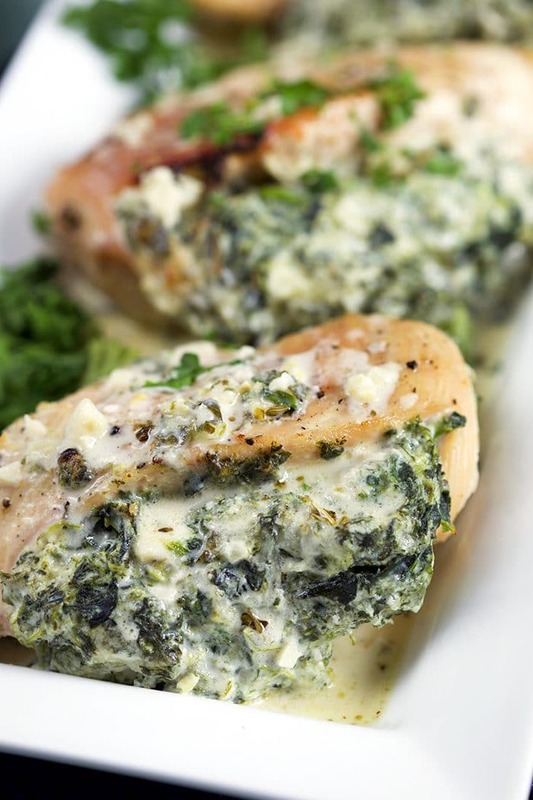 Spinach and cheese stuffed chicken breasts baked to a golden, melty perfection will have your family begging for seconds. 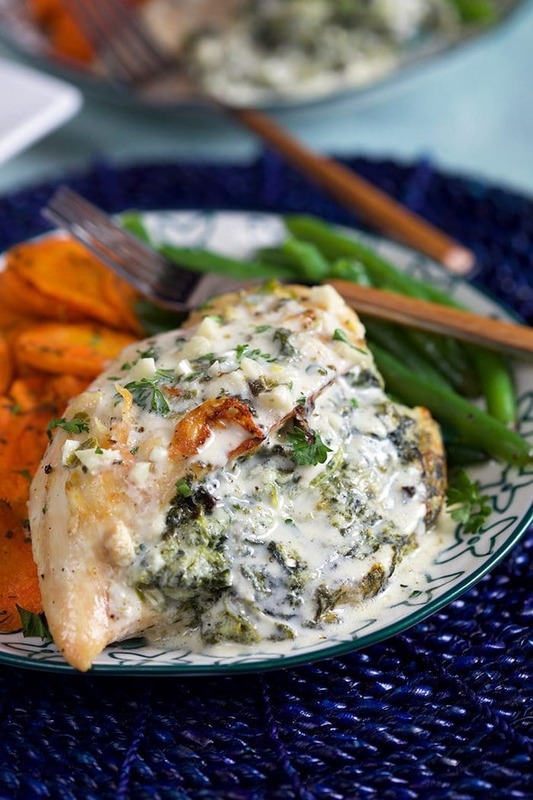 If you like spinach dip…..this easy oven baked chicken recipe is for you! 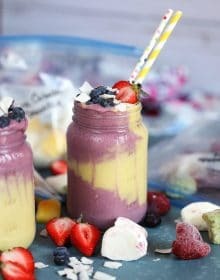 One thing that I love about winter is, even though you’re trying to eat healthy….resolutions and all, you can still veer off that path once in awhile without having to worry about that whole bikini body thing. I mean, we have about 5 or 6 months before we need to pull on a pair of shorts. Right? 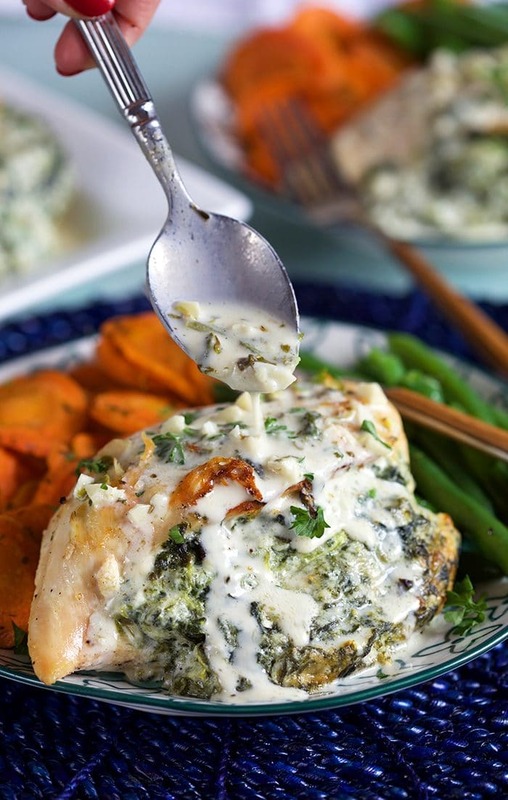 And the winter chill makes me crave ALLLL the comfort food so I’m mashing up two of my favorite things into one easy weeknight dinner…..cheesy spinach dip stuffed into an oven baked chicken breast. Who’s with me? I’m definitely not blazing any trails here with this recipe but I can assure you that this is the BEST Stuffed Chicken Breast recipe you’ll ever make. 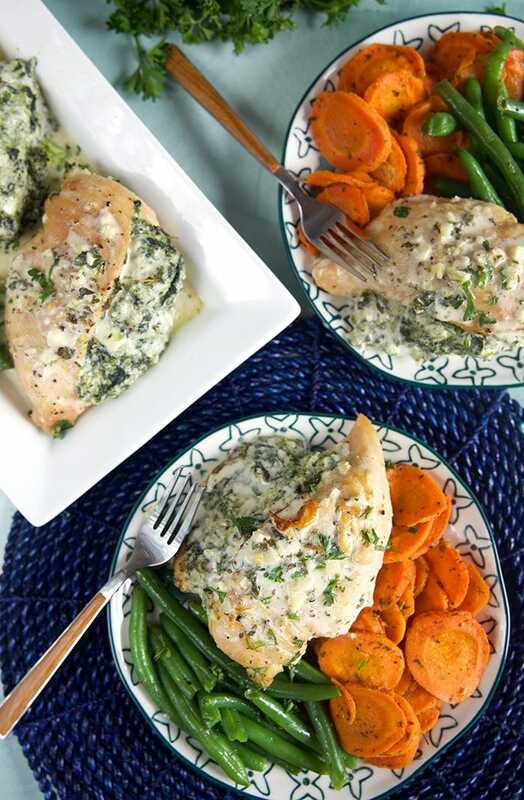 Spinach cream cheese stuffed chicken breast is the ultimate dinner recipe and kids absolutely devour it….even though it’s loaded with the green stuff. 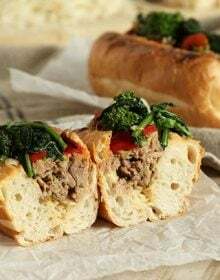 To come up with this idea…..I blended together the same ingredients I use for my favorite spinach dip recipe and then, basically, sandwiched them inside a chicken breast that I cut a tiny little pocket into the side of. So many variations of stuffed chicken cutlets are only limited by your own imagination. If you’re not a fan of spinach you can stuff your chicken with asparagus, broccoli or absolutely nothing but the cream cheese filling. Not too shabby if you ask me. Basically, in a nut shell, stuffed chicken breast is exactly that. A butterflied chicken breast cutlet stuffed with whatever your little heart desires. 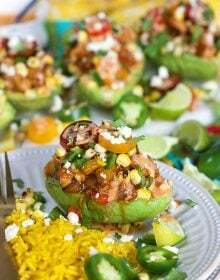 You can be as creative or as basic as you want stuffing your chicken with anything you like. How do you make Spinach Stuffed Chicken Breast? 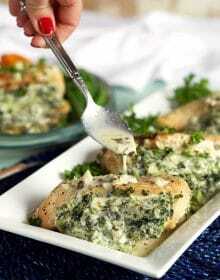 Cheesy Spinach Stuffed Chicken Breast is so easy to make with ingredients you already have in your kitchen. I like to use frozen, thawed spinach that’s been drained so that I always have it on hand. Fresh spinach spoils so quickly and has to be chopped, then sautéed before mixing with the cream cheese mixture. Using frozen spinach saves you a step and some money. 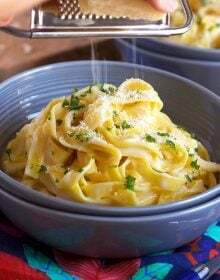 In the bowl of a food processor or blender, add the cream cheese, yogurt, spinach, parmesan, cheddar, salt and pepper. Blend until almost smooth. Add the butter and garlic to the pan sautéing until the garlic is fragrant, approximately one minute. Stir in the chicken stock scraping up the brown bits with a wooden spoon or spatula. 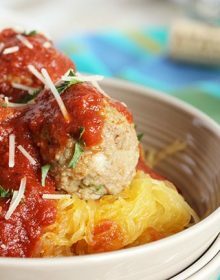 Add the parmesan and cook for 1 minute longer. 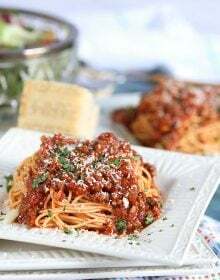 Serve with the pan sauce and extra parmesan cheese, if desired. How long do I cook Stuffed Chicken? It’s important that your stuffed oven baked chicken breast is cooked all the way through so an instant read thermometer will be your best friend here. Simply stick the instant read thermometer into the thickest part of the chicken (not the stuffing as that will read a higher temperature since it’s not as dense and will heat quickly) and remove the chicken from the oven when the temperature reads 160 degrees F.
Allow your Spinach Stuffed Chicken Breasts to rest for 10 minutes before serving, the temperature will rise and the chicken will continue to cook a bit while it rests. This easy Baked Chicken Breast with Spinach and cheese will DEFINITELY become one of your favorite weeknight dinners. 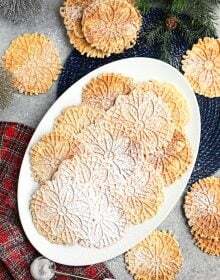 It’s also fantastic for easy dinner parties. 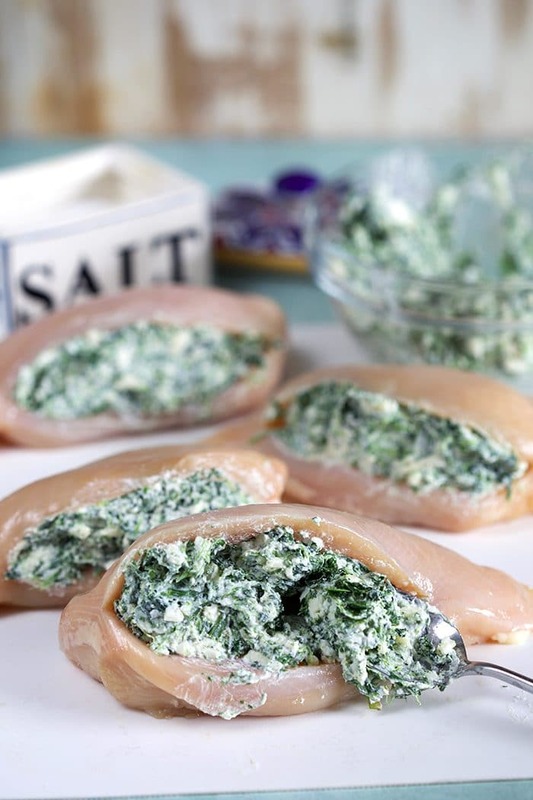 Can you make Spinach Stuffed Chicken in advance? 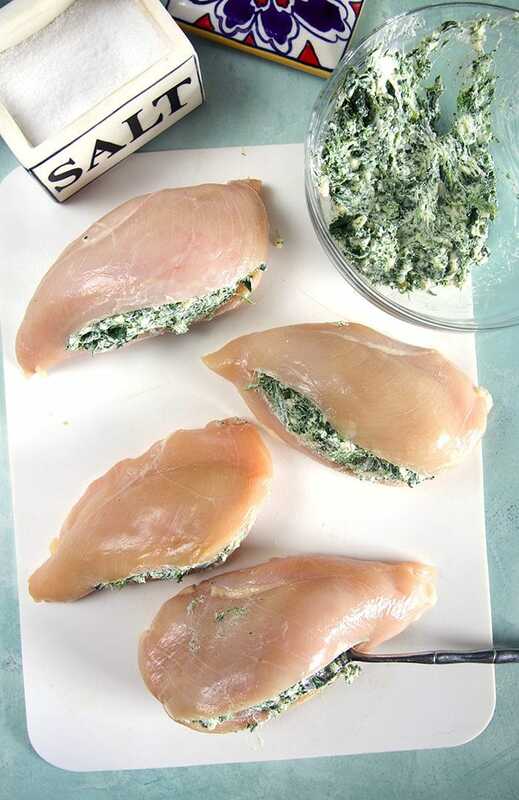 To make this easy Spinach Dip stuffed chicken in advance simply assemble the chicken up to the point of cooking, wrap tightly in plastic wrap and store in the refrigerator until ready to cook. You can make the chicken up to 24 hours in advance and then follow the cooking instructions to complete the recipe. Brown Butter Peas with Mint…so fast and easy! Bacon Parmesan Roasted Potatoes are crispy and addicting. 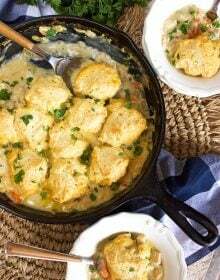 Want even more easy Chicken Breast Recipe? These are my family’s favorites right now! 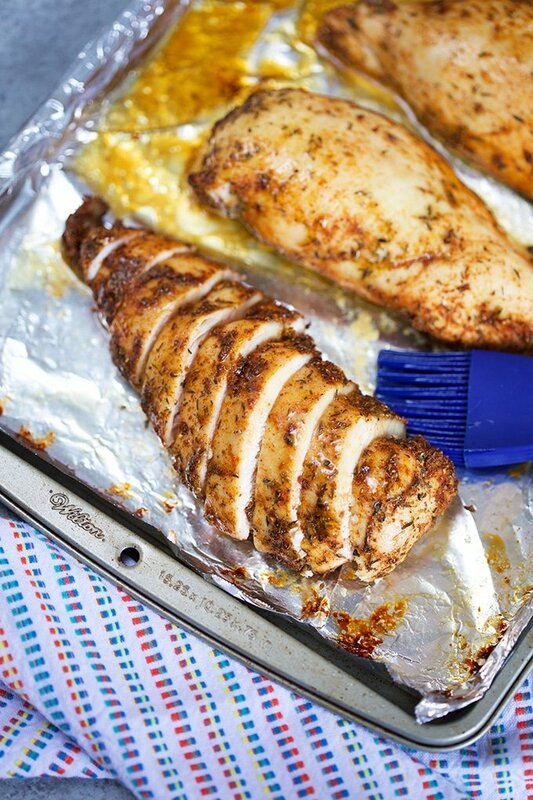 Parmesan Crusted Chicken Breasts….a kid hit! 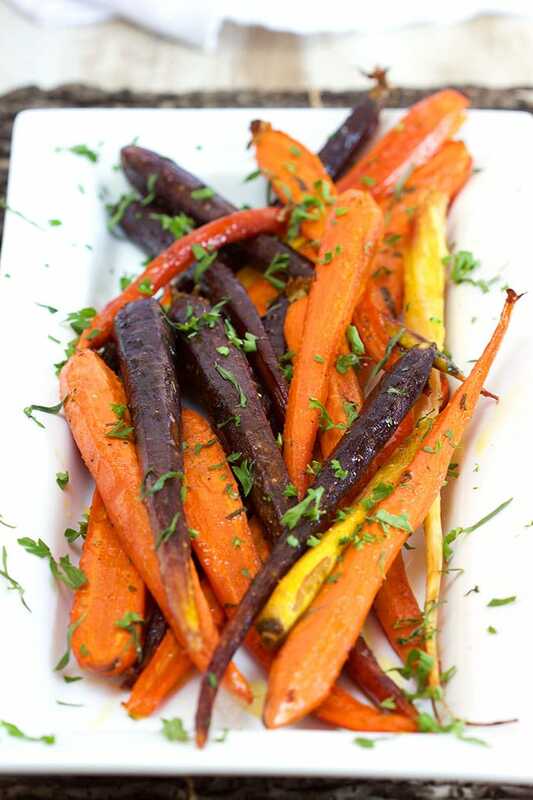 Looking for more fast and easy dinner recipes? Be sure to follow us over on Instagram! 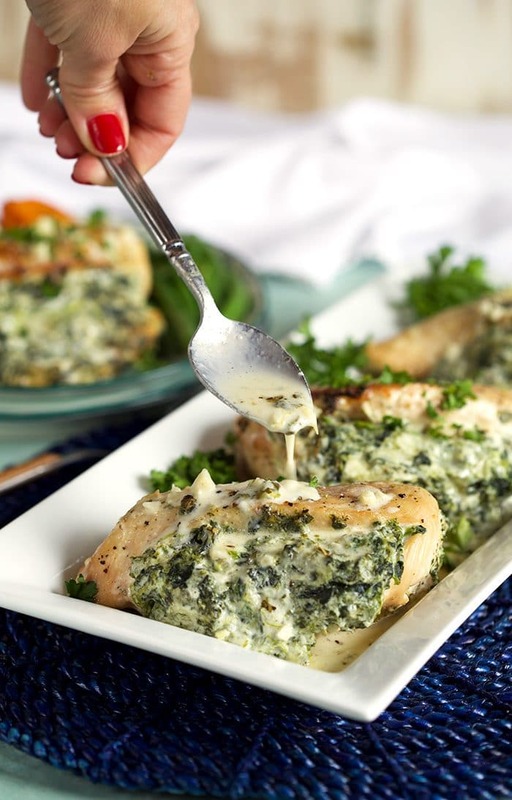 Stuffed with a cheesy, melty spinach dip, this easy Spinach Stuffed Chicken Breast recipe is going to be the best thing to hit your dinner table. 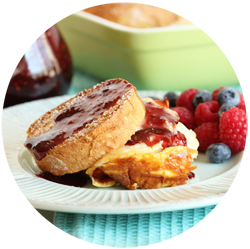 In the bowl of a food processor or blender, add the cream cheese, spinach, yogurt, cheddar, 2 tablespoons parmesan cheese, salt and pepper. Add the butter and garlic to the pan sautéing for 1 minute until the garlic is fragrant. Add the chicken stock to pan scraping up the brown bits with a wooden spoon or spatula. Stir in the remaining parmesan cheese. 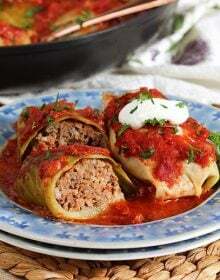 Chicken can be stuffed up to 8 hours in advance and stored in an airtight container in the refrigerator until ready to cook. Alternatively, spinach cheese stuffing can be made up to 24 hours in advance.